…the growth of charter schools and vouchers are necessary because public schools are failures. People believe this since the media blasts it out every chance it gets…the media supported and paid for by the privatizers, of course. The truth is that American public schools are not failing. 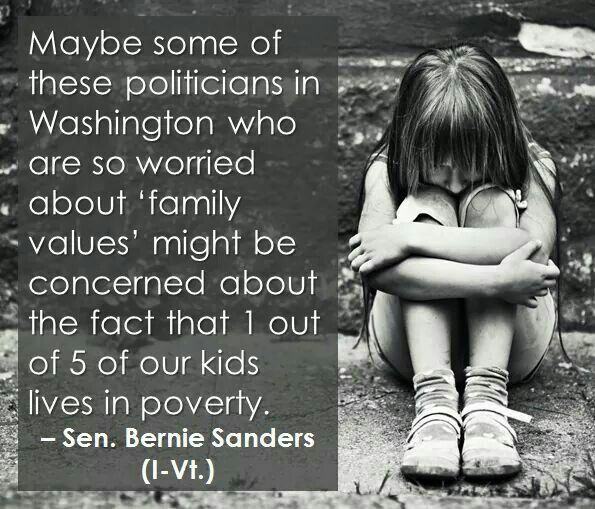 American society is failing to deal with the level of poverty in our nation. objections to privatization from teachers are suspect because teachers unions are “only in it for the money.” The fact that states with strong unions have higher achieving students than states with weak unions doesn’t get mentioned. Is it coincidence that lower achieving states, with weak unions, also have higher levels of poverty? Teachers and their unions aren’t the problem. Poverty is. K-12 tenure means that people believe teachers continue to teach even after they are past their prime — and have a job for life no matter how ineffective they are. Tenure, in K-12 education, is simply “due process” which isn’t explained well and is commonly misunderstood. Privatizers encourage this misunderstanding. standardized testing is necessary to hold teachers and schools accountable. The fact is that tests are misused by people who should know better. Those who do — the testing companies — aren’t going to cut into their profits by telling states and school systems to use fewer tests. No one admits that the tests are invalid for evaluating teachers and schools. Privatizers gloss over the fact that poverty level is the single most important factor in a child’s score on a standardized test. These myths are ubiquitous. How can we help people learn the truth beyond the corporate party line? Privatization in Indiana continues. More and more money is being diverted from public education into a growing number of charter schools and the state’s voucher program. Charter schools in Indiana, for example, got a raise this year including the opportunity to use $50 million in loans…on top of the $90 million of forgiven loans from 2013. As the Indiana legislative session for 2015 entered its final hours, a last-minute gift was thrown into the budget for the state’s 79 charter schools. They were given a boost of $500 per pupil in new funding, along with the ability to tap into $50 million in loans for capital projects. The addition was made without discussion, without a hearing, without public input, and obviously without concern for the taxpayers. Gov. Mike Pence has made it his mission to “improve” education in the state by taking money away from the public school system, rearranging funding to benefit suburban, affluent, predominately Caucasian schools, and otherwise bending the system to the advantage of those most likely to vote for him next fall. Meanwhile, public schools serving those students most in need of resources continue to struggle and are encouraged to compete against one another for the high-achieving students who bring with them the promise of greater funding via performance incentives. The usual answer: the taxpayers of Indiana. “In 2013, the state forgave and paid off more than $90 million in charter school loans. The move drew protests from traditional public schools whose loans were not forgiven and consequently charter schools were no longer given access to the loan money. “Kenley said Pence and House Speaker Brian Bosma plan to do the same thing again with the new loan program — an assertion that neither denied outright. “It’s always a possibility in the future,” Bosma said. Indiana taxpayers are supporting religious schools…and that support (as well as support for secular private schools accepting vouchers) has increased from $16 million to $40 million in one year. The state supreme court has ruled that vouchers are not “tax supported religion” which would be disallowed by the state constitution, so the church (and synagogue and mosque) coffers continue to swell with our tax dollars. The cost of Indiana’s private school voucher program jumped from $16 million to $40 million during the past school year, according to a new report released Tuesday by the Department of Education. Critics of the voucher program say the report proves that subsidizing private education is costly and unsustainable. But supporters say the new figure is misleading. At issue are publicly funded vouchers that families who meet certain income requirements can use to send students to private schools. More than 29,100 students received vouchers during the recently completed academic year, up from about 19,800 the year before. Those numbers make Indiana’s program one of the largest in the nation. What are the privatizers motives? For some, it’s simply money. Textbook and test publishing companies like Pearson are reaping huge profits from the privatization of public education and the myth of public school failure. Religious privatizers believe that public schools teach communism, atheism, secular humanism, and other blasphemous philosophies. These theocrats want a church controlled nation with church controlled education. You may wonder how this is sustainable. It isn’t, and it isn’t meant to be. Charters routinely drop out of the business, move on, dissolve and reform under new names, getting out of Dodge before they have to offer proof of success. This churn and burn is a feature, not a bug, and it is supposed to foster excellence. To date, there is no evidence that it does so. But in the long term, we get a two-tier system. One is composed of private, profit-generating school-like businesses that will serve some of the students. The other is a vestigal public system, under-funded and under-served, but still serving as “proof” that public schools are failure factories and so we must have a state-run system. Poverty matters. Two more articles reminding us that the problem with America’s public education system is not bad teachers or low test scores, but the fact that nearly one-fourth of our children live in poverty. Children living in low-income households who endure family instability and emotionally distant caregivers are at risk of having impaired cognitive abilities according to new research from the University of Rochester. …poverty remains a frustratingly accurate predictor of how well schools will perform. Schools full of middle-class kids rarely perform below average on state tests; schools made up of low-income kids rarely score above. In fact, test score data in Illinois indicate that the degree to which poverty is tied to school performance is slightly stronger than it was a decade ago—despite reforms that have included school re-staffings, closures, consolidations, new state standards and more stringent guidelines for evaluating teachers. The privatizers’ plan for the teaching profession? Make teaching unattractive so professionals will leave or not even start. Lower standards to include inadequately trained personnel. Hire temps (TFA) at lower costs. Not only are schools of education enrolling fewer teacher candidates, but more and more current teachers are leaving the profession early. While some would argue this is only a short term problem, others say this makes teaching less attractive and creates another long term problem. “They’re going to have to find a way to make the profession attractive again for new teachers to say in the profession and for teachers who are experienced to stay in the profession until retirement,” Lynn said. The Common Core is money machine…driving up profits for Pearson. Well, if I am enriching above and beyond the CCSS, what do I need the CCSS for? If the CCSS is not laying out a path for a full, quality education, what path is it marking? It’s laying out the path to the test. The CCSS are just the largest scale test-prep guide ever created. The CCSS tell us what we need to cover for the test, and the test tells us how well we covered it. If there were no test, the CCSS would not matter. The CCSS are also, of course, about making money. No Child Left Behind (NCLB) also wanted to bust into the big piggy bank that is public school funding, but NCLB was a big, blunt hammer; CCSS is a more sophisticated machine with many interlocking parts. In fact, the biggest reason that CCSS cannot be rescued is directly related to the difficulties those of us who write about education have had in explaining the problems with CCSS. And it is probably the biggest lesson that the powers that be learned from NCLB. Teachers: Who’s on your side? Where can you go for people dedicated to truth-telling for democracy? 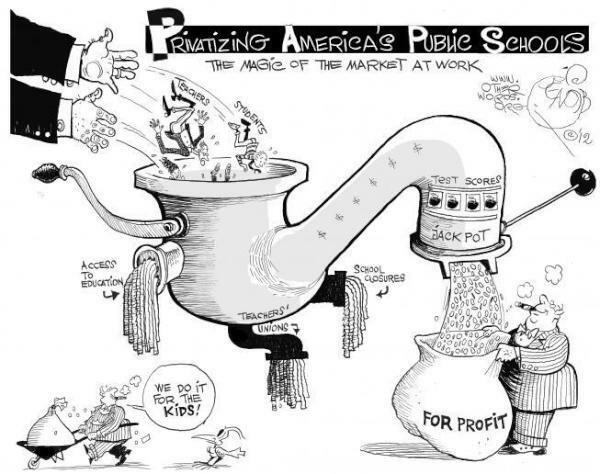 Here is where you can get information about the privatization movement and its impact on public education. Read and learn. We, the below undersigned organizations, oppose high-stakes testing because we believe these tests are causing harm to students, to public schools, and to the cause of educational equity. High-stakes standardized tests, rather than reducing the opportunity gap, have been used to rank, sort, label, and punish Black and Latino students, and recent immigrants to this country. High-stakes testing has become intrusive in our schools, consuming huge amounts of time and resources, and narrowing instruction to focus on test preparation. Many of these tests have never been independently validated or shown to be reliable and/or free from racial and ethnic bias. High-stakes tests are being used as a political weapon to claim large numbers of students are failing, to close neighborhood public schools, and to fire teachers, all in the effort to disrupt and privatize the public education system.